Did Life as We Know It Once Exist on Mars? Copyright © 2004 J.J. Hurtak, Ph.D., Ph.D.
NASA’s mission briefing (the week of 3 March 2004) on the progress of the Mars rover at Meridiani Planum, introduced startling new evidence of water once abundant on the red planet and the astrobiological puzzle of the close association of water and sulfur. The evidence of the Mars Exploration Rover (MER) called Opportunity clearly showed what some planetary scientists and exobiologists call “overwhelming evidence” of water–lots of water–existing on the planet Mars. that ground water could create an environment favorable for life. In short, the signs of strong water movement around and through the rocks allow the rocks to speak of environments within meteorite craters that could have had all the right triggering mechanisms for life that we find here on earth. 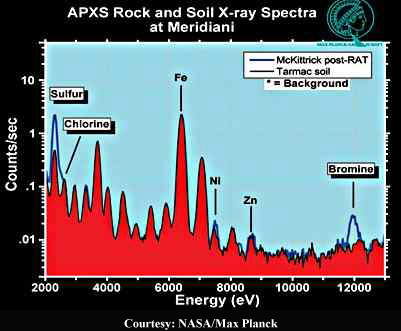 Martian sediments were formed and are in their present condition because of evaporating brine (water with a lot of salt). Dr. Jim Garvin (NASA’s leading scientist for Mars and Moon explorations), Ed Weiler (associate director of NASA), and other experts were very careful not to give reporters any time-line for the early existence of water on Mars, while other scientists are willing to say this would fall within a geological time period of 3 to 4 billion years ago. This writer recalls talking to Garvin in the mid-1980s when Garvin spoke of his interest in participating in a far-reaching program of “exploring Mars that would turn a dream into reality.”  In conclusion, NASA now agrees that there was an extensive presence of water on the Martian surface for an extended period of time. Whether this was long enough to trigger life as we define it on planet Earth remains to be seen. The variety of the evidence suggests that the next mission is to find “fossils” which will be the confirmation of the beginnings of the great chain of life. Life might not have been so fortunate to continue as it did on planet earth, but there is no clear clue why it would not have started. We know that Earth, itself, has had many cataclysmic epochs where massive extinctions took place all over the globe. Could Mars have been so unlucky that a similar extinction ultimately destroyed all life? Let’s hope we don’t have to stay tuned too long until the next chapter of life unfolds on Mars. 1. Dr. Steve Squyres, principal scientist for MER exploration at NASA briefing 3 March 2004. 2. Bentley Clark at press conference 3-03-04. 3. Personal conversation with Dr. Jim Garvin at time of SIR-A briefings, JPL, Spring 1986. Images taken by NASA’s Mars Global Surveyor (MGS) showing the flow of ‘liquid water’ on the surface of Mars were released on 7 December 2006. This has increased the scientific expectation that Mars could have the same mechanisms of evolution as its sister planet, Earth. Our knowledge of Earth tells us that ‘where there is water, there is the mechanism of organic life’ and the future possibility to create a human habitat. The discovery of liquid water on Mars is not only momentous evidence of life past, but a major step toward the future ‘humanization’ of outer space. 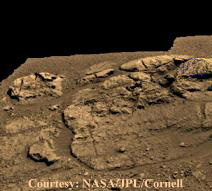 The evidence of water comes from a comparison of several images from the Global Surveyor’s Mars Orbiter Camera (MOC). While image data acquired in December 22, 2001 (E11-03412) showed no evidence of water, images of the same geographic point on August 26, 2006 (SO9-02603) showed new landscape traces, appearing as a place where liquid water recently flowed. Several pictures have been taken of the site, starting on 30 August 1999 (MO4-04175). 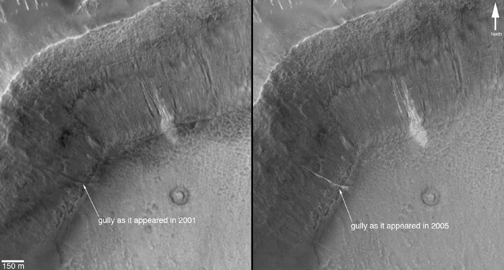 A light deposit was seen with the MOC as early as 21 February 2004 (R14-02285), the first indication that something was taking place, looking like a stream bed on a downslope area in a specific mid-latitude gully area on Mars. In fact, several gully regions have recently revealed newly formed light-toned areas, usually around southern walls. This is an attribute one would expect of surface materials eroded by a fluid substance with the properties of liquid water. Numerous elongated marginal branches and pathways mirror exactly how waters flows around obstacles. The liquid flow is clearly visible even at low relief and is not the movement of dust particles. Initially it was assumed that this was just the result of wind blasts on the surface of Mars, but the fact that several Martian gullies have shown similar surface changes has allowed scientists to reconsider that what they are observing is evidence of a liquid water flow. Gullies would be the most obvious places for water flow and these new observations have been characterized as a “squirt gun” effect, where small amounts of liquid water flow out from near surface sources for a short time before refreezing (NASA, 2006). Apparently, snow and ice flow is strong enough in some of the Martian gullies to cause a brief, low-volume debris flow, initially energized by liquid pressures but in which ongoing flow, freezing at both the top and bottom, takes place after a short period of time. The most promising images (as seen here) have been taken from a crater in Terra Sirenum near 36.5 degrees South, 161.8 degrees West, and there are other images such as those taken of the southwest wall of a crater in the Centauri Montes region near 38.7 degrees South, 263.3 degrees West. In addition to the obvious surface brightness values, remote sensing scientists have observed that the new light-hue deposits are clear evidence that a surface change has occurred. Even to the amateur observer, it is evident that there are new, relatively long, extended marginal branches in the gullies. These are consistent with water flow patterns at relatively mild inclination levels (image enhancement indicates the slopes are between 20 degrees and 30 degrees). Because the materials have retained their light hue over a period of time, scientists have considered this due to various sediments captured by the flow such as salts, or simply frost or ice. All this has encouraged NASA to explore Mars further in a search for organic remains of micro-life. NASA’s forthcoming Phoenix program to Mars (2007-2008) will employ TEGA (the Thermal Evolved Gas Analyzer) which has eight thermal ovens the size of a common writing pen, that will receive soil from the lower arctic area on Mars and then heat it up to look for signs of life. How do these new findings fit into the picture of our world? In recent years a research team made up of members from the Mars Society and NASA Ames Research Center in northern California traveled to Devon Island, some three hundred miles south of the Arctic Circle. A 20-member scientific team lived in a small habitat similar to what would be placed on the Martian surface (hopefully by 2024) to find clues to the sociological and technical survival skills required for living in Mars’ cold, windy and arid landscape environments (Mackay, 2006). Conceivably, Mars may soon be offering us something we can no longer find on earth: empty continents into which excess populations could migrate. As with any living environments, the availability of clean water is a crucial factor. The finding of ‘water resources’ on our sister planet is a major factor for off–planetary movement of space pioneers and is part of a solution to exo-industrialization development using resources in outer space. Water, for example, could provide not only a survival resource but an energy resource, establishing the base-line for the growth of scientific habitats to suit a new generation of humanity. While the short-range motivation for some is space industrialization, others envision the possibility of small city platforms on the high frontier with the “pull” of both physical and humanistic expansion–and thus survival– of humankind. As we gain a new living environment in space, we also need to acquire additional long-term goals establishing friendly, space-derived services and products for the development of future generations of humanity living in space. With a new space law (Hurtak, 2005), the sharing of space resources will come as a bonus to our grandchildren. The next great leap for humankind is right before us! 1. 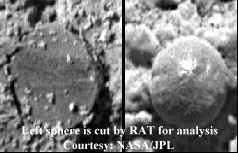 NASA (2006) Pictures cited are from the MOC operations during the multiple extensions of the MGS mission conducted under NASA/ Caltech/Jet Propulsion Lab leadership. 1999-2006. 2. MacKay, Christopher (2006) Conversations between MacKay and this author at the 7th Annual Mars Society Conference, Washington, D.C., 7-12 August 2006. 3. Hurtak, J.J. (2005) ‘De olho no espaco para preservar a Terra’ in A Noticia News, Santa Catarina, Brazil. October 9, 2005.